Island Princess has two specialty restaurants - - Sabatini's and the Bayou Café. Sabatini's is a Princess tradition that is throughout the Princess fleet. "Sabatini's features Italian cuisine. In Italy, we have a different way of cooking in each region. From one region to the other, we are use different spices. North, we use more butter, south, we use more garlic and tomato. And each region has its own pasta shape. [Sabatini's] covers most of the regional cuisines." Decorated like an Italian villa, Sabbatini's is an elegant dining experience. "It is very quiet, very nice ambiance, nice music and a great menu, of course." Although Sabatini's is a tradition, the concept has changed recently. "Before it was trattoria style. People did not have to order everything, only the main course. We used to [automatically] pass around all the appetizers, salad and pasta. [Only] the main course was ordered by the customer. We had feedback from the passengers that this was too much food. So, now it is by order. Whatever you feel like having, you order. So the concept has changed a little bit." This venue is divided into two areas - - a restaurant area and a bar area, which has tables and a a dance floor. "People can go into the restaurant for a dinner or people can have a beverage outside next to the dance floor. For people who enjoy jazz, if they want to dine inside the venue they are welcome or they [can] sit at the bar and just to listen to some great jazz music." The menu carries forward the New Orleans theme featuring Cagun/Creole cuisine. In addition, it has several steakhouse offerings. "The quality of the cuts is the same as in the Sterling Steakhouses [on other Princess ships], which is a premium cut meat." There is a $20 cover charge for dinner in the Bayou Café. An English-style pub lunch is also offered in the Bayou Café on certain sea days. It is open to all and the food is complimentary. Above: Sabatini's on Island Princess. Below: A table in the Horizon Court. Executive Chef Klaus Baumgarten presents a lobster dish at the Chef's Table event. Another specialty dining event is the Chef's Table. It is a combination of: a lavish meal; a behind-the-scenes tour; and an opportunity to interact with the ship's executive chef and maitre d' hotel. The overall experience is more than a sum of its component parts, however. It is usually only held once or twice during a cruise and participation is limited to a handful of guests. Thus, it is advisable to sign up for this event as soon as possible. The evening begins with the maitre d' welcoming the participants and explaining the issues presented by having guests visit the ship's main galley while dinner is being prepared and served. "He goes over all the public health points before he takes them to the galley and lets all the customers wash there hands." The guests then don white laboratory coats, which they will wear throughout their time in the galley. Next, the maitre d' introduces the ship's executive chef and together they give the guests a brief tour of the galley and explain its operation. Stopping at an unused preparation area, the guests are given glasses of champagne and a stream of specially-prepared appetizers is brought to them. During this time, they can chat with the executive chef and maitre d' and ask questions about how the ship's culinary operation works or about cooking in general. The guests then adjourn to a large table in one of the main dining rooms for a multi-course dinner. This is a feast that would have pleased even Henry VIII. Not only is there quantity but the quality of the dishes prepared just for the Chef's Table is beyond all reasonable expectations. "For the Chef's Table, we have several menus. The chef will choose according to his professional taste. He has a free hand in that. Of course, the chef puts in his inventive insights for a very personalized dinner." As each dish is presented, the chef and/or the maitre d' explain what it is and how it was prepared. In addition, there are wine pairings throughout the meal with a sommelier discussing each wine. At the end of the meal, each guest receives a copy of Princess' hardcover cookbook "Courses" autographed by the chef and maitre d' plus a group photograph taken by one of the ship's photographers. The cost is a $95 per person. Island Princess' buffet restaurant is the Horizon Court. It is open for breakfast, lunch, afternoon light snacks and dinner. The Horizon Court is located near the top of the ship in the forward part of the superstructure. The seating area offers views forward as well as to port and starboard. It does not look like a cafeteria but rather like a restaurant/observation lounge. "We have introduced personal service up there. We try to give as much service as possible to our customers regardless of if they come to the dining room or the Horizon. We call it personalized service to the customer." While passengers select their food from the buffet lines, there are waiters to assist them once the passengers sit down. "There are three guys in charge of each section. One cleans the table; one serves and one does beverage service. We set up the tables. All three of them do public relations, asking 'how was it' and getting as much feedback as we can as to customer satisfaction." 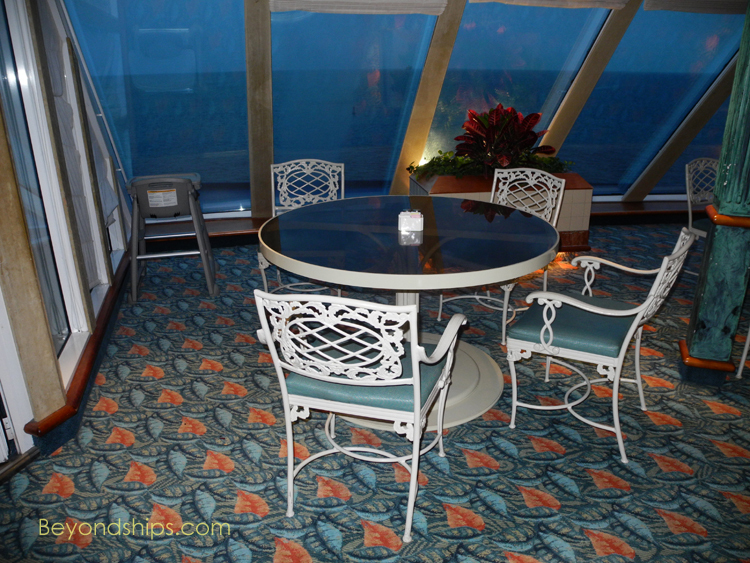 In addition to Horizon Court, Island Princess has several smaller informal dining places. On Deck 15, the Grill offers hamburgers and light fare. One deck below, there is the Pizzeria and the Ice Cream Bar. Also, during the day, there is a cart in the main lobby's La Patisserie that has a selection of pastries and sandwiches which changes during the course of the day.